Criselda Yabes is a seasoned journalist and award winning author and journalist. 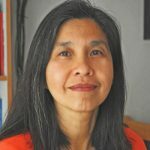 She has worked as an international Correspondent for the Associated Press, Newsweek, Reuters, The Washington Post and The Economist covering political insurgencies, rebellion and coup d'etats in the Philippines as well as war and crises across the globe. She was born in Quezon City, she spent her early years growing up in Zamboanga and there developed an affection for the Muslim Region which is a favourite subject for her literary works. She graduated from the University of the Philippines. She is the author of five published books, the most recent of which, 'Peace Warriors' is about literary journalism regarding military affairs in the Muslim Mindanao Region which won the National Book Award for non-fiction in 2012.